...evoke a Mediterranean village, complete with whitewashed houses, azure skies, colourful flowers and a balmy air. 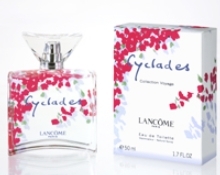 The Cyclades juice is a musky floral, opening on notes of neroli and bergamot essence, leading to a heart composed of oleander and jasmine. The base is a blend of white musk and vanilla hyperabsolute. Other recent launches from Lancôme: Hypnôse Sheer, Trésor Sparkling, Trésor Elixir. The notes sound indeed right! If only Bougainvillea had a scent – it would have been the perfect note to go with that name!! Nothing can describe the beauty of hundreds of those fuschia or purple blooms against the blinding white of the houses. Does Magnolia have a strong scent? Last summer I've seen a whole lot of Magnolias but I cannot remember if they smelled nice. Bougainvillea is so beautiful indeed and exists in wonderful pinkred as well and in other lovely shades. Oh I mean Oleanders, not Magnolias!! Divina, the beauty of bougainvillea against a stucco wall is one of the things I truly miss about living in southern California. Some (maybe most?) oleanders have fragrance, some don't. Helg, haven't loved any of the Lancome travel scents so far, but as you say, we'll see! Robin NST for some reason I believed that you lived in Washington D.C.! I grew up in the DC area, and not too far from there now (a couple hours). That is so nice about your country: you can go a few thousand miles eastbound, westbound, north or south, just anywhere for that matter and the language is still English, the food is the same and the culture is merely the same. Only nature varies a whole lot. It is so much more relaxed. It is one of those things you forget to appreciate – being able to travel the way we can. But the accents, food and sometimes even the culture are so wonderfully different from region to region here in the US. People speak so much slower and draw things out when they talk here in the south (as I do now too!) I had a hard time understanding people and their southern slang when I first moved here from out west. I'm curious Marianne, what country are you in? M, I would say the opposite: it would be nice to go a few thousand miles and be someplace entirely different & new. But the world is getting smaller and the chain stores larger, so that is getting harder even if you leave the country. Rose I am in the Czech Republic right now but I am from The Netherlands originally. I've lived in several countries so I have roots here and there on this planet which I like but then it is also hard to say goodbye and to start all over again. I am green with envy – you live right in the middle of everything! I've traveled and lived all over the states, but I've never had a chance to go to Europe. I think it's so interesting that we can love the same things and talk about it here living on opposite sides of the world! I always associate Greece with that hot, dry and spicy smell of wild thyme and other aromatic herbs in the sun. I'll have to smell this just to see if it evokes anything of the kind for me – doesn't sound like it would, unfortunately. Try the new Aedes/Molinard Histoire de Chypre! As the spring goes from fresh&chill to sunny and bursting with green and flowers, I started to wear again Cyclades, that I have only sprayed twice last year, not satisfied with my aquisition. And surprise! It gave me optimism, evoking the Greek islands and making me nostalgic for the last summer. Now i like it a lot. Glad your bottle won’t go to waste!